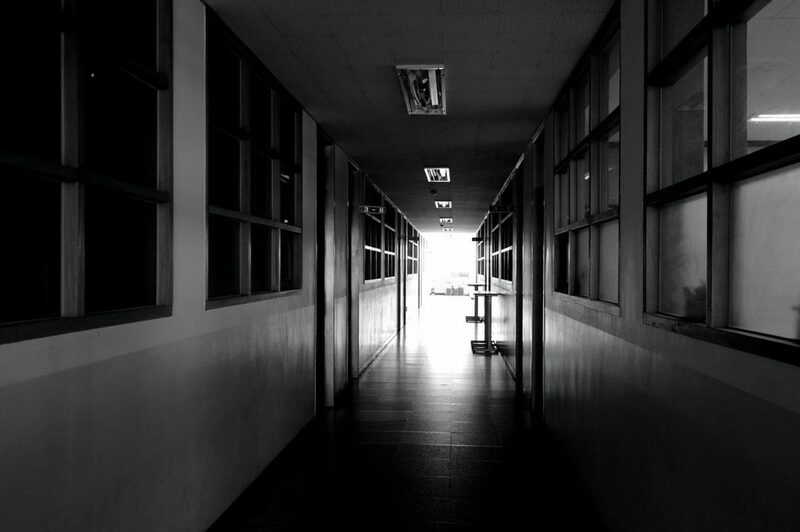 A school hallway. Image courtesy of Pixabay. I’ve gone to the last two William Jewell College CUAt the Movies nights in a row. For me, that’s huge progress. My intrusive thoughts fixate heavily on death, and the occasions wherein people have shot up movie theaters in our country fueled my anxiety. Before getting help, I had panic attacks throughout any movie I saw in theaters. I don’t remember exactly when it started – when theaters stopped being exciting and started being nerve-wracking – but I remember the movies I had the worst panic attacks during. In England, I went to movie theaters without the same intense anxiety. Though this correlated with my new treatment, it also was impacted by the fact that it was much less likely for death to occur during a movie. Still, seeing “Love Simon” was mildly terrifying, mostly because there was always the chance of bigoted violence, no matter what country I was in. But, within the past few weeks, I’ve seen the new “Spiderverse” movie again, as well as that awful new cyborg girl movie – you know, the one where the cyborg girl’s eyes are obnoxiously huge, where her design is both pedophilic (sexualizing characteristics of children) and sexist (sexualizing femininity to suit the ever-present heterosexual male gaze). I digress. The point is: I was in the same movie theater, twice, recently. The point is that last semester, I went to two or three movie theaters. There was a huge improvement in my anxiety. I didn’t have a panic attack, nor did I feel like I was actually in danger. I did notice, however, that the awareness itself of the possible violence hadn’t left. What remained felt like a callously casual awareness of gun violence possibilities. A little bit of fear did surface during those moments, but it was muted. When thinking back on these moments, I’m reminded of the gun violence drills I experienced during middle school and high school. They were moments of distant terror and excitement – the excitement coming from the fact that sometimes, these drills incorporated toy or water guns. I’m now well aware of the bizarreness of making these drills exciting or fun. Everything about them felt awkward, and even without the nonlethal guns, the drills allowed for morbid conversations. We would informally plan attacks, utilizing whatever we had in our disposal to maim or kill in self-defense. Being on a college campus now only makes the conversation continue in its bizarre-ness. When we have drills for campus intruders I’ve been in my room, and I’m unfazed. Sometimes, these drills just feel like they’re for the adults, so they have a game plan. They have to think about violence as separate from their daily lives, probably because for them, for the most part, it has been. Of course, my experiences are nuanced by being a white person who passes as female. Although I do experience the additional anxiety of male violence, I do not have the same anxieties as people of color do, nor do I face the same oppression. Gun violence within our country is an issue that must be approached from an intersectional perspective. It must be said that my experiences are informed by my social positions. I am interested in the additional trauma our generation faces from school shootings. Yes, I waited to say that directly until the middle to end of the article. Yes, I know, it probably seems like an overstated political topic right now. I mean, I guess my response to that sentiment is that it could be an overstated political topic if you’re just that apathetic and disconnected from the issue of prevalent violence? The truth of things is that for us students, on some level, being on a college campus or a school means there’s automatically an awareness of potential gun violence. We’re living in a constant drill, a constant moment before the violence. And, again, that’s just one moment of shared violence awareness – one that is complicated by other social issues. I hope that we can find ways to heal from this and change our circumstances so that future generations don’t have to deal with it. For now, I think it is important that we keep talking about this, that we fight against the normalization of prevalent violence. When we stay silent about our numerous experiences being drilled on and prepared for imminent violence, we allow the conversation to be dominated by less helpful perspectives and voices.